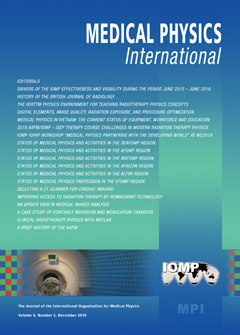 The IOMP Journal Medical Physics International will address various education/training, professional and related issues. The Journal will initially have two issues per year. This section will include specific publications of the Organisation. Here we shall welcome papers related to medical physics professional development, information from Societies and Federations, etc. Here we shall welcome papers related to new courses, new materials, e-learning, training schemes, etc. Here we shall invite papers from prominent colleagues on the development of a particular method or equipment. This information will be useful to many teaching colleagues. Here we shall include papers from manufacturers about their new equipment and activities (including paid advertisement information). These papers could also be interesting for a broad spectrum of colleagues and will provide good information for teaching materials and CPD courses. Review articles will provide a coherent and comprehensive view of the state-of-the-art of specific topics in medical physics and related technological developments. This will include insight into the evolution and developments leading to the current status with emphasis on the vision and efforts of the various contributors. A special value of the review article is its focus on the continuing process of research and development that is the foundation of contemporary metical physics contributions to society. This can include proposed directions for the future. Tutorial articles are provided to enhance learning opportunities for specific topics that might not be adequately covered in current textbooks or other resources. Typically these are evolving topics associated with advances in medical physics applications and associated technologies. They are designed to enrich the learning experience and concept development with visuals supported by text explanations and guidance. Depending on the topic, they can be used in a variety of medical physics courses as assigned study or for continuing professional development for medical physicists. Here we shall welcome papers related to the specific performance of various methods, protocols, measurements, etc – i.e. useful practical information. Here we shall include various information related to new books and publications; PhD abstracts; Letters to the Editor; Conference Proceedings, etc.